Who said that pigs can't multi-task? This unique two-chambered Save & Spend Piggy Bank with patent-pending design gives the traditional piggy bank a real run for its money. 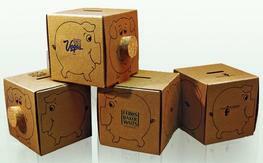 The traditional piggy bank has been around for centuries. But we live in a new, financially complex world so it was time to apply some fresh thinking to this beloved product. Fresh and exciting promotion teaching the importance of saving money. Save Money and the Earth at the same time! Printed with earth-friendly water-based ink.